Buy or Rent Bearly Asleep (1955) Movie DVD & BluRay Online! 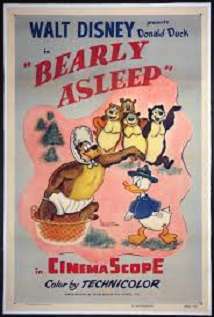 Movie Plot: Park ranger Donald sends his bears off to hibernate, but Humphrey would rather stay in his hammock, run out for a glass of water, etc., than sleep; when he does get to sleep, his snoring gets him thrown out. His search for a new bed leads him right into the ranger’s house.